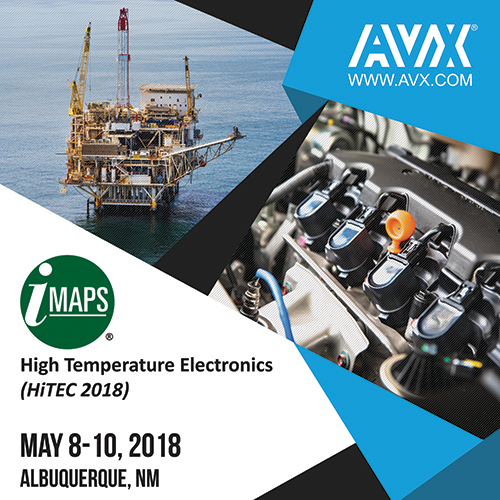 The exhibition will highlight several selections from AVX’s ever-expanding range of proven-reliable, high-temperature ceramic & tantalum capacitor solutions. FOUNTAIN INN, S.C. (April 27, 2018) – AVX Corporation, a leading manufacturer and supplier of advanced electronic components and interconnect, sensor, control, and antenna solutions, is showcasing its portfolio of high-temperature capacitor solutions during the exposition portion of the International Microelectronics Assembly and Packaging Society’s (IMAPS’) International Conference on High Temperature Electronics (HiTEC 2018), which will take place May 8-10 in Albuquerque, New Mexico, and is widely recognized as the industry’s premier biennial technical conference dedicated to the advancement of high-temperature electronics research and applications. AT Series High-Temperature, & 200ºC and 250°C Rated MLCCs, which deliver high-reliability, long lifetime performance at operating temperatures in excess of the current 125°C requirement in emerging military and commercial applications, are the only high-temperature MLCCs with reliability test data at 250°C, and are rated at both 250°C and 200°C to provide engineers with optimal derating schemes. THJ 200ºC Series SMD tantalum capacitors, which exhibits less than 1mA of leakage current after 1,000 hours of operation at 200ºC and is ideal for oil drilling, aerospace, and automotive applications. For more information about the high-temperature AVX capacitor solutions described above, please click on the embedded links or navigate to AVX’s High-Temperature Product Range Application Guide and AVX’s High-Temperature Solutions Catalog. For more information about HiTEC 2018, please visit http://www.imaps.org/hitec/. For all other inquiries, please visit www.avx.com, email inquiry@avx.com, follow them on LinkedIn and Twitter, like them on Facebook, call 864-967-2150, or write to One AVX Boulevard, Fountain Inn, S.C. 29644.